Fall in love with every little detail of Splashin’ Treehouse, a gorgeous 3-bedroom, 3 ½-bathroom cabin boasting wooded mountain views for up to 10 guests. 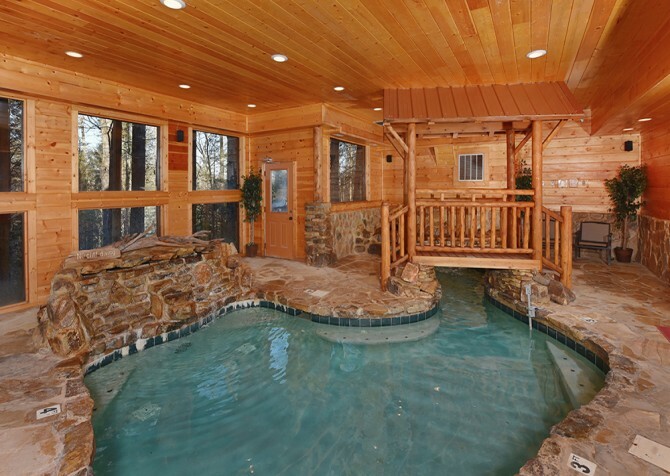 From the exquisite furnishings to the plethora of amenities, a stay in this Gatlinburg cabin promises the best of Smoky Mountain relaxation and entertainment. All the while, the semi-private Splashin’ Treehouse is less than 10 miles from the heart of Gatlinburg, where guests can spend their days shopping, dining, exploring, and playing. After exploring the majestic beauty of the Great Smoky Mountains National Park, return to cabin décor devoted to lending guests that serenity of the Smokies right in the comfort of the cabin. Log furnishings, bark accents, alluring well-lit spaces, and exquisite stone accents create a soothing natural atmosphere to enjoy while cooking in the fully loaded kitchen, watching TV on the living room flatscreen, and sharing meals around the impressive dining room table. There is so much to do in Splashin’ Treehouse; spending fun-filled days in the cabin are sure to be some of your favorite Smoky Mountain memories. Play ping-pong and foosball with the kids or shoot some pool over drinks with friends. Challenge family to classic arcade games on the 2 free-play arcade systems before taking a dip in the indoor swimming pool. Sink into sublime relaxation during your cabin stay with long soaks in the outdoor hot tub, luxurious bubble baths in the indoor jetted tubs, and peaceful swaying on the porch swing. Host cookouts on the expansive covered deck while flipping burgers on the gas grill on laid-back afternoons, rain or shine. After a day of making memories in the great outdoors of the Smoky Mountains, crawl into king-size beds for restful nights of sleep and wake up to lovely wooded views each morning. Gather around the majestic man-made tree for evening games by the fire with friends and family in this magical living room with ceilings stretching high above the branches. Dreamy natural lighting pours in through numerous windows in the spacious common room areas and moves throughout the open-concept cabin – creating an airy, relaxing atmosphere perfect for a midday nap underneath the tree. With tons of floor space and ample cushy seating, you have an ideal stage for games like charades and gift exchanges during the holidays. Pop in your favorite Blu-ray or DVD movies from home and sit back and enjoy your movie on the large flatscreen TV or challenge the kids to games on the Xbox before sitting down to home-cooked meals. Shiny stainless-steel appliances set against wood interiors and stone tile floors create an alluring mountain-meets-modern kitchen where guests can throw together picnic lunches to take on scenic hikes and big, multi-course dinners during the holidays. The long, spacious countertop to the right of the full-size refrigerator is the perfect food preparation area before popping your signature dishes into the oven. Cleanup is a breeze in the large, stainless-steel double sink and dishwasher, letting you get back to the evening’s group games in the living room after dinner. There’s ample space to store growlers from Smoky Mountain Brewery in the full-size refrigerator along with delicious leftovers from Crystelle Creek. Relaxing mornings in Splashin’ Treehouse are well spent with fresh cups of coffee and warm English muffins from the toaster oven before sitting down at the deck’s cushioned dining set to savor the crisp mountain air while enjoying your breakfast. The impressive 10-chair log dining set boasts enough elbow room for every guest to enjoy family dinners together in the cabin. The wide tabletop provides enough space to make it a family-style affair and set out large portions with serving utensils to pass around the table before digging in. With everyone going different directions among school, work, games, and more, the memories made around the dinner table are sure to be some of your favorite as you spend quality time with the ones you love. Toast to the bride during a bachelorette weekend getaway, share embarrassing stories among siblings you hardly see any more, and bond with friends over the now-hilarious scares from your trip through the Ripley’s Haunted Adventure while seated around the table each day. No fighting over bedrooms in this stunning cabin! Every suite boasts quilted king-size log beds, gorgeous wooded views through large windows, and flatscreen TVs to watch your favorite shows before falling asleep. Unwind at the end of the day after ziplining, shopping, horseback riding, and dinner shows with a relaxing bath in the soothing waters of the large indoor jetted tubs in each bathroom. With no rush to be anywhere in the mornings, climb into a hot bath surrounded by exquisite stacked stone walls and enjoy wooded views though the window. The walk-in showers are readily available in each suite, making showering after hikes and primping before elegant dinners in Gatlinburg a much easier task for your large group. Additional guests will love sleeping under the majestic tree in the living room after enjoying a warm fire and some TV from the 2 queen sleepers. Centrally located in the cabin’s large open-concept common room, guests will love spending time together while dinner cooks, the big game plays in the living room, and a few others sit down to their leftovers at the dining room table. Sip on drinks while playing 8-ball in your own private pool hall or convert the table to ping pong to play a few lively rounds of table tennis. Laugh as you and your friends try your hands at the arcade games and slowly realize you are not as good as you used to be in your younger gaming days. Kids will love playing the classics like Pac-Man and Galaga before taking on parents on the foosball table in the loft. 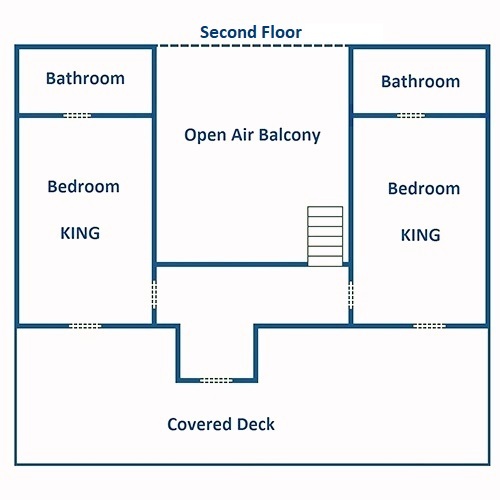 Adjacent to the back deck, walk along the short pathway to enjoy your own private indoor swimming pool any time of day, rain or shine! 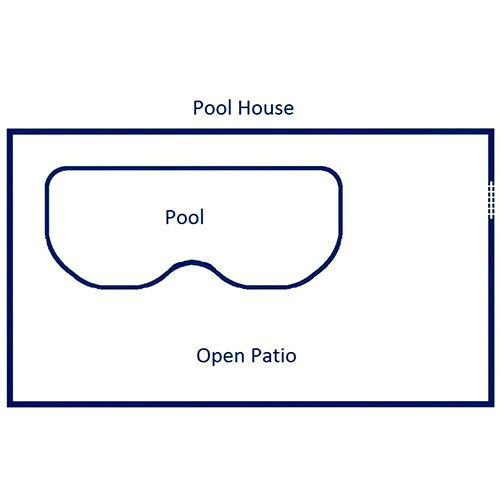 The kids will love playing in the 8’ x 20’, 3’ to 5’ deep pool while parents relax in the cushioned poolside patio furniture. 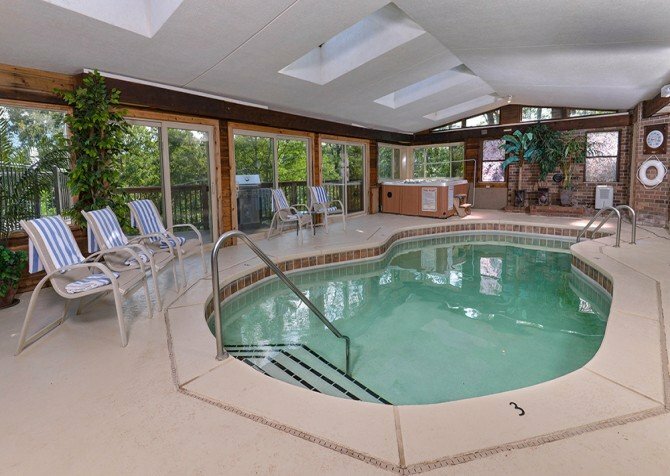 Adults will love splashing around in the evenings or squeezing in a few laps in the morning to work off some of those vacation calories from large meals in downtown Gatlinburg. 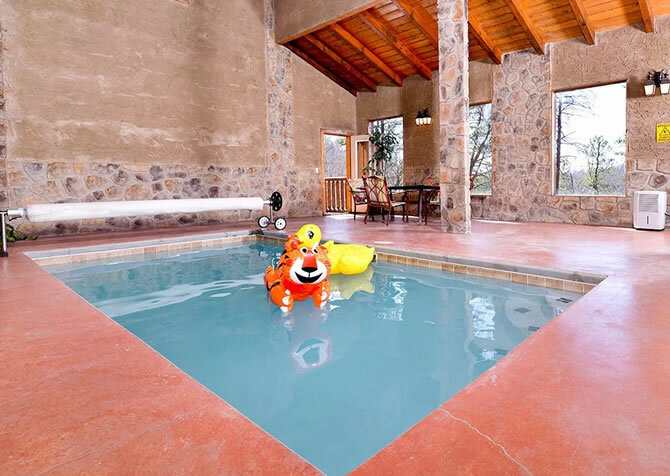 With towels already supplied, just be sure to pack your swimsuits and the kids’ favorite pool toys! 2 patios and a large deck are supplied with glider chairs, outdoor dining furniture, and a swing for guests to enjoy as much of the great outdoors as they desire from convenience of the cabin. Bring your freshly brewed cup of coffee to the porch and enjoy reading a good book during the tranquil hours of the morning. Sway slowly with the grandkids in the porch swing overlooking the rolling valley during laid-back afternoons in the cabin. Stop by the local grocery stores on the way to the cabin to pick up hot dogs and hamburgers to throw on the gas grill for fun cabin cookouts, rain or shine, around the cushioned dining set on the covered deck surrounded by lush green forestry. After a day of shopping in the Great Smoky Arts and Crafts Community and breathtaking, scenic hikes in the Great Smoky Mountains National Park, soothe tired muscles in the bubbly waters of the outdoor hot tub with the hypnotic sounds of the cicadas and crickets in the evening. Established over 50 years ago, the talented artisans stationed along the 8-mile loop represent the authentic American creative spirit that began in the early history of the Great Smoky Mountains. Shop among the nation’s oldest independent group of artisans to find gorgeous hand-made jewelry, quilts, leather goods, and much more. If the views don’t steal your breath away, maybe the dueling ziplines will! Visit Gatlinburg’s newest 55-acre mountaintop attraction modeled into a magical treehouse-themed park with fun activities such as the Tree Canopy Walk and the United States’ first Single Rail Mountain Coaster. Adorned with millions of magical holiday lights and filled with Christmas spirit, the most wonderful time of year is amplified in the beautiful city of Gatlinburg from early November through February! Experience one of the South’s largest holiday celebrations set near the country’s most visited national park. "We spent a week at Splashin’ Treehouse, and it is even more attractive and comfortable than the pictures show. The decor is great, the beds are very comfortable, and there are plenty of things to do even on days you stay in. We did not have a big need for the internet while staying there, but if you were planning on doing a bit of work online while visiting, beware the internet is satellite and limited. Not a problem for us, but could leave someone in a jam. Kids very…"
"We spent a week at Splashin’ Treehouse, and it is even more attractive and comfortable than the pictures show. The decor is great, the beds are very comfortable, and there are plenty of things to do even on days you stay in. We did not have a big need for the internet while staying there, but if you were planning on doing a bit of work online while visiting, beware the internet is satellite and limited. Not a problem for us, but could leave someone in a jam. Kids very much enjoyed the pool, the hot tub, and all the games. It is a nice, quiet area, way back in the woods. 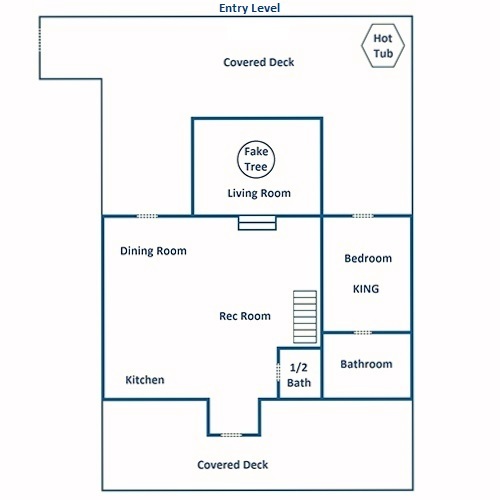 We would recommend it without hesitation."